Buy De Wit Japanese handhoe left: <ul><strong><li>Hand forged carbon steel and solid ash</li><li>Double-sided blade cuts on outward and inward stroke</li><li>Lifetime guarantee</li></strong></ul><br>Similar to their Cape Cod weeder but with a larger blade, the De Wit Japanese handhoe is a lightweight but incredibly sharp tool for tackling weeds.<br><br>Shaped like a mini scythe, the hoe is forged from a single piece of carbon steel for exceptional strength and sharpened on both sides of the blade for maximum efficiency.<br><br>Excellent for slicing through even the toughest perennial weeds, the hoe can be inserted below the surface to access roots lurking underneath mulch and bark. 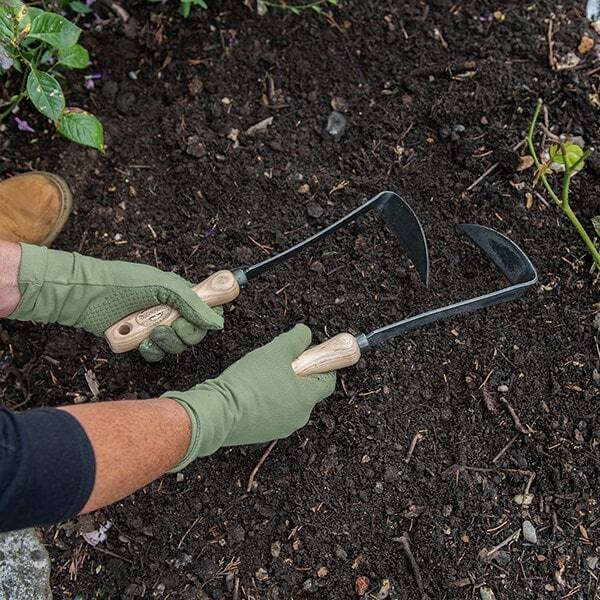 It's also great for loosening soil, digging planting holes, lifting tap roots, pruning small plants and even cutting grass.<br><br>The hoe is fitted with a smooth ash ergonomic handle for a secure, comfortable grip.<br><br>Please note: the hoe is available in both left-handed and right-handed versions. This model is for left-handed use.<br><br>Measurements:<br>Head 11cm x 3cm<br>Total length: 32cm<br><br><strong>About De Wit tools</strong><br><br>The Dutch are renowned for making the world’s finest garden tools, and De Wit is the most respected name of all. Founded in 1898, the family-owned toolmaker combines old-fashioned quality and craftsmanship with innovative design to create superior tools that last a lifetime.<br><br>Every tool is hand-forged in the Netherlands from tough boron steel - shaped, sharpened and burnished for durability, giving it the same blackened patina as traditional Edwardian tools. Each is fitted with an FSC-certified solid ash handle for ultimate strength and shock resistance, oiled to provide first-class protection against the elements.<br><br> All De Wit tools come with a lifetime guarantee against manufacturing defects, making them a truly once in a lifetime purchase. Please note: the hoe is available in both left-handed and right-handed versions. This model is for left-handed use. 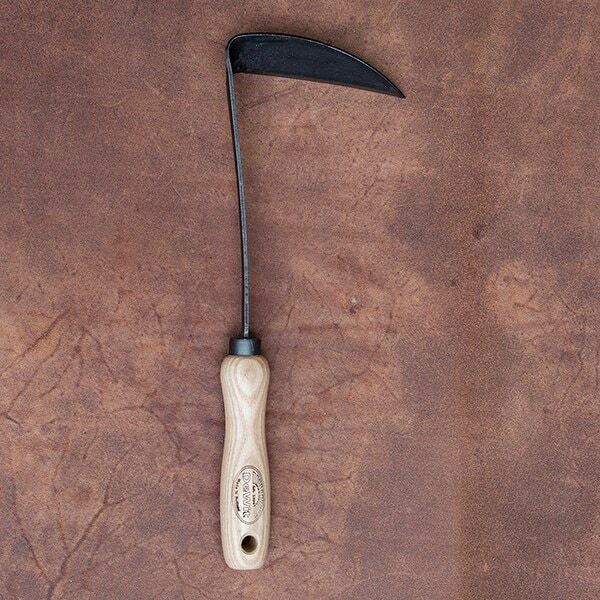 This is the best hand tool for weeding I have ever come across (and I've tried several). I'm sure the right handed tool will be equally good. 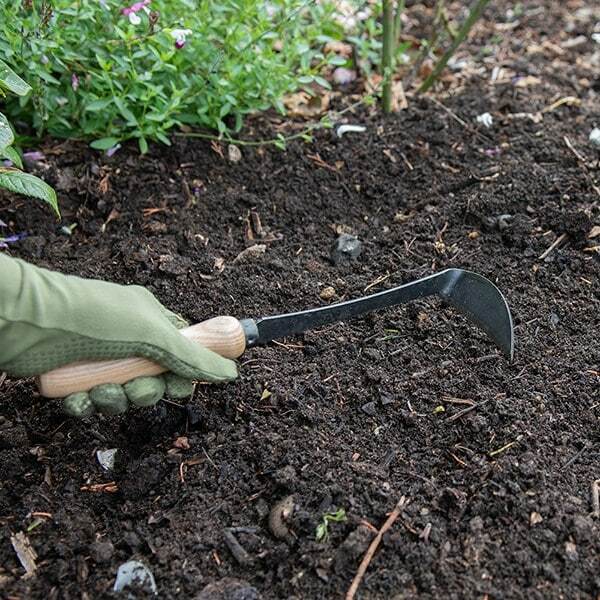 It's well balanced, and glides through the soil taking out even medium size (2ft) weeds at the root with barely any resistance. I haven't found any negative points at all. Care would be needed where spacing is smaller than the blade (e.g in the veg bed among seedlings) but it can be angled to account for that. Just be careful you don't get carried away and take out your plants, too, it's easy to get very enthusiastic with it!